“As fraud investigators, CFEs, financial crime investigators, you have got a big responsibility,” Dr. Graeme Edwards, CFE, AAICD, Director of CYBERi Pty Ltd, told attendees at the 2018 Fraud Conference Asia-Pacific. He was referring to the fraud examiner’s responsibility to know the right procedures to document and preserve evidence so that it is permissible in court, specifically when dealing with volatile digital evidence. In his session, “Navigating the Digital Crime Scene,” Dr. Edwards provided applicable, real-life advice on how a digital crime scene should be processed and worked. 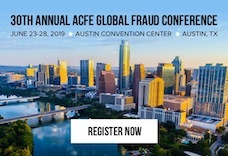 Dennis Gentilin, a whistleblower in the National Australian Bank foreign exchange (forex) trading scandal will join investigative journalist Kate McClymont and Tony Kwok, the former deputy commissioner and head of operations for the Independent Commission Against Corruption (ICAC), as speakers for the 2018 ACFE Fraud Conference Asia-Pacific.